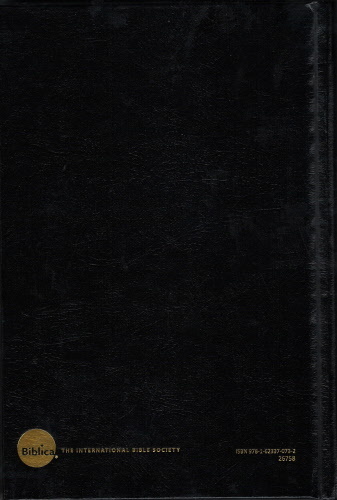 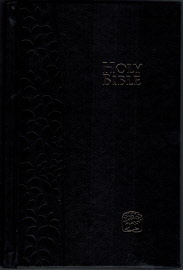 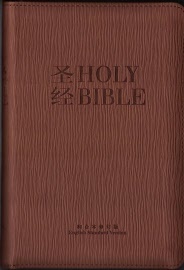 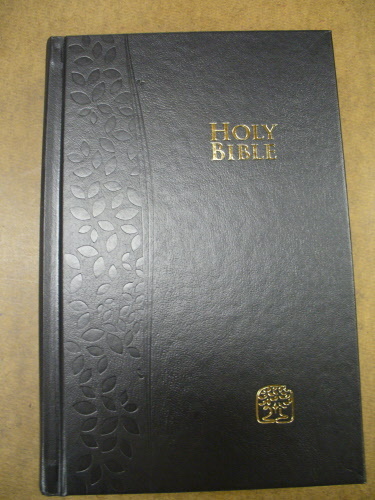 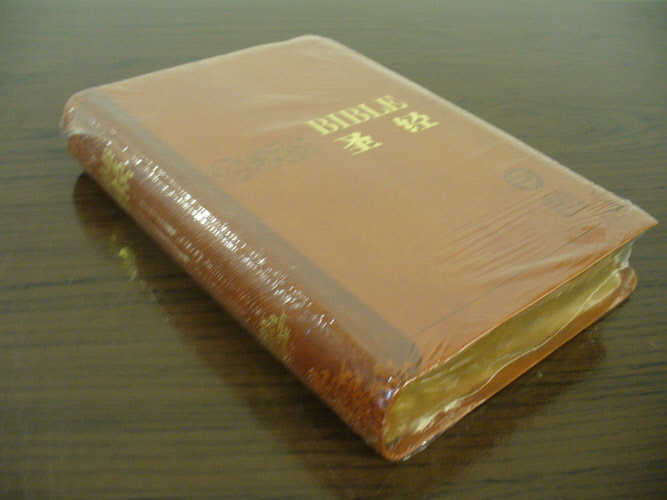 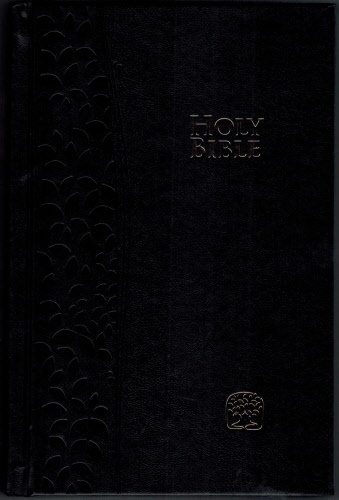 Paperback CUV/NIV (2011 Version) Bible. 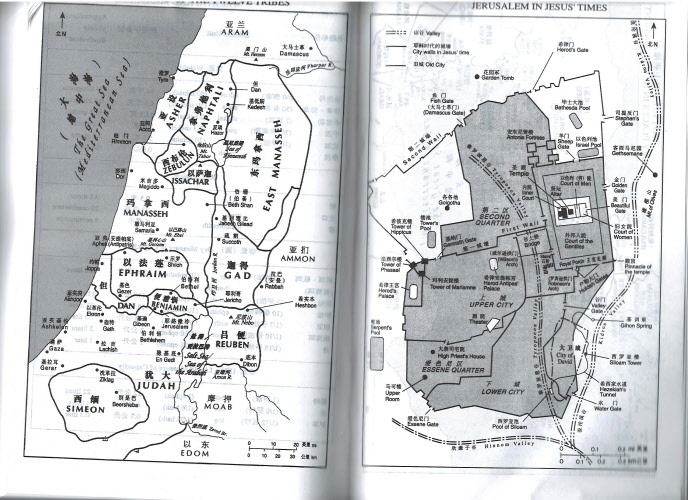 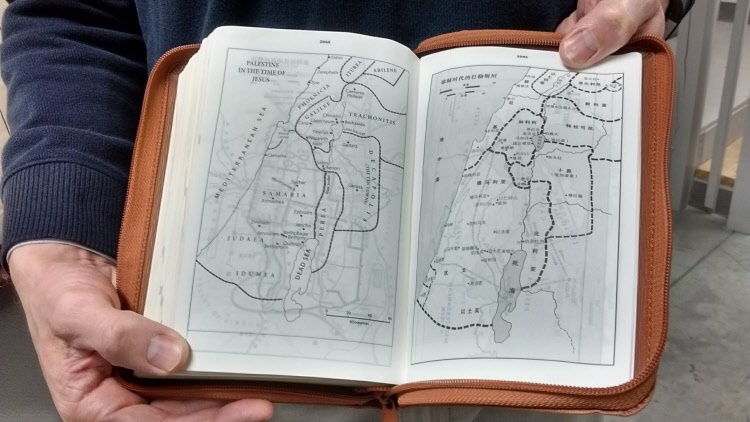 Drama of the Bible (Introduction) and maps. 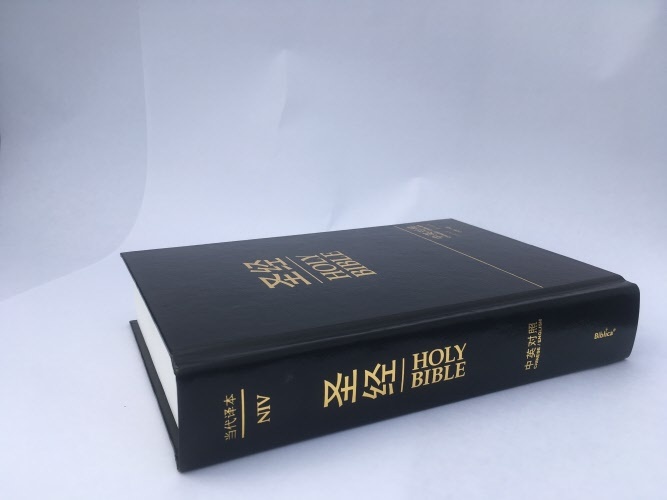 9" x 6"
Because the Table of Contents has wrong page numbering for the New Testament books, we will include a corrected table of contents for each Bible. 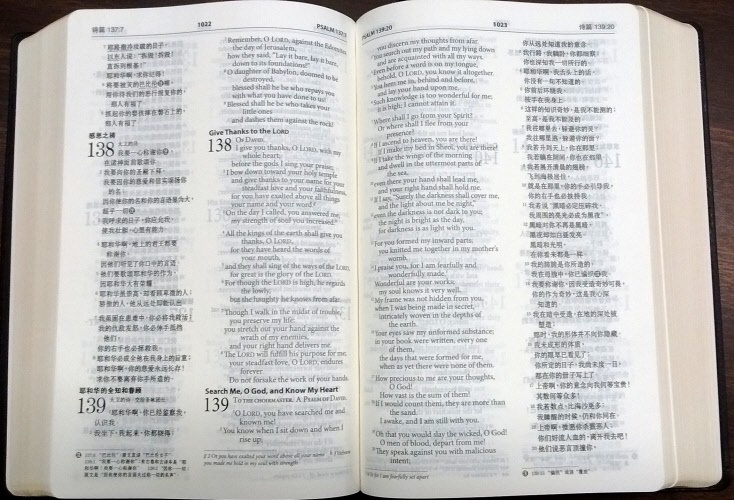 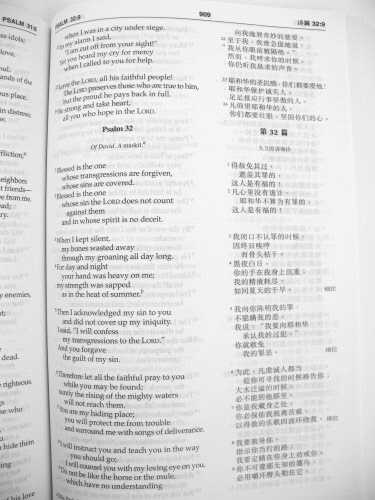 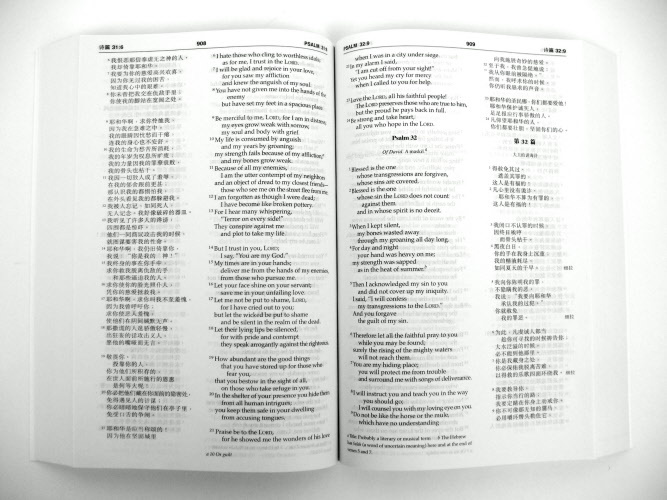 This parallel bilingual Bible offers a side-by-side treatment of the Chinese Contemporary Bible (CCB) and the English New International Version (NIV). 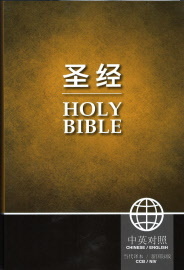 The NIV is the world’s most widely read and trusted contemporary English translation of the Bible. 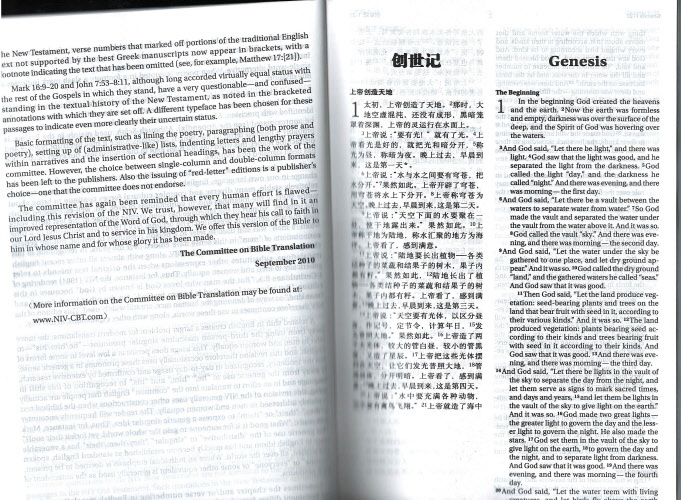 The CCB and NIV are both clear, accurate, easy to understand and uncompromisingly faithful to the original Bible texts. 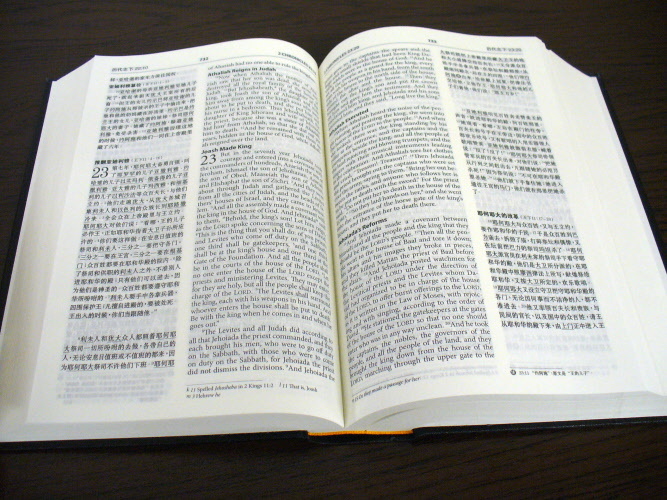 The CCB’s natural fluency and precise structure brings a fresh reading experience to its many readers. 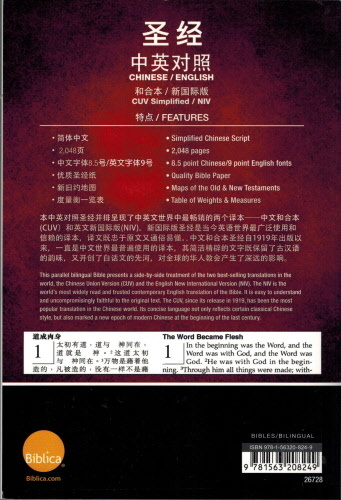 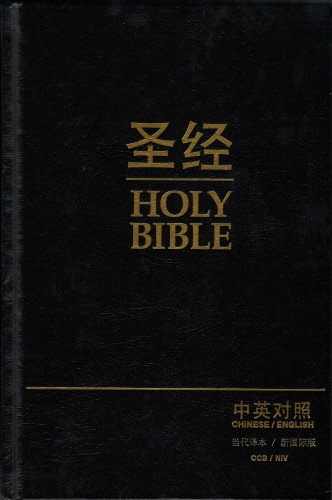 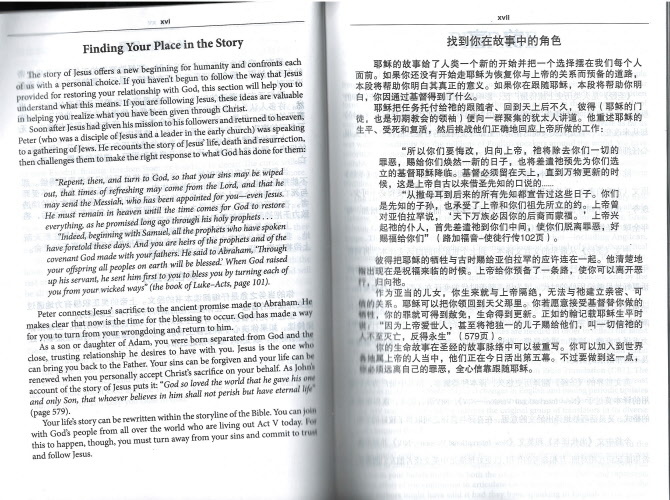 Simplified Chinese Script/English, Chinese Contemporary Bible/New International Version(2011), Paperback, 8.5 pt. 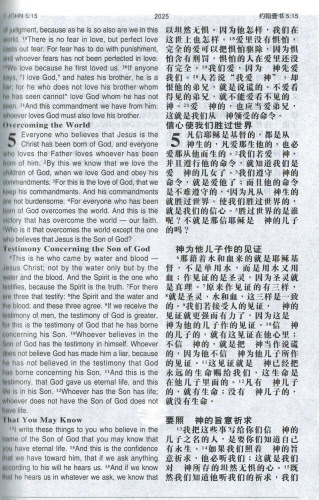 font in Chinese, 9 pt. 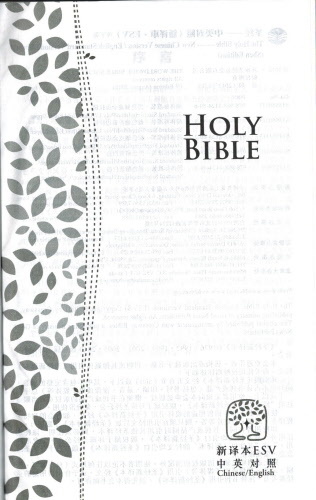 font in English, Maps of Old and New Testaments, a Table of weights and Measures, Footnotes throughout the Bible. From the Publisher: This parallel Bible offers a side-by side treatment of the Chinese Contemporary Bible (CCB) and the English New International Version. 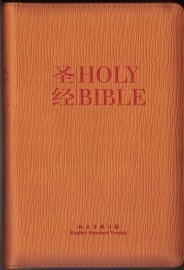 The NIV is the world's most widely read and trusted contemporary English translation of the Bible. 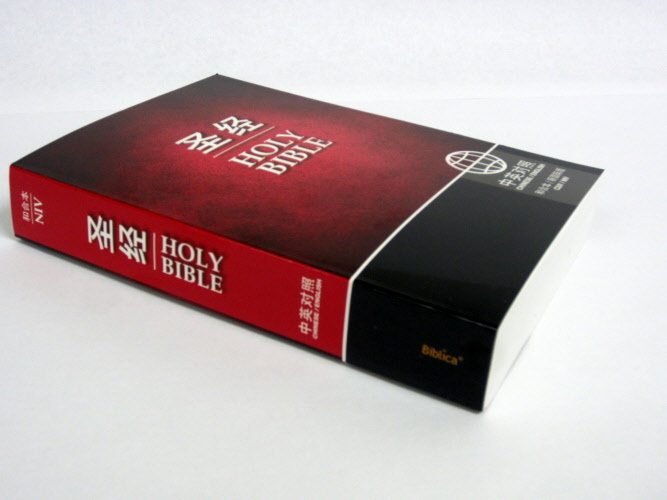 The CCB and NIV are both clear, accurate, easy to understand and uncompromisingly faithful to the original Bible texts. 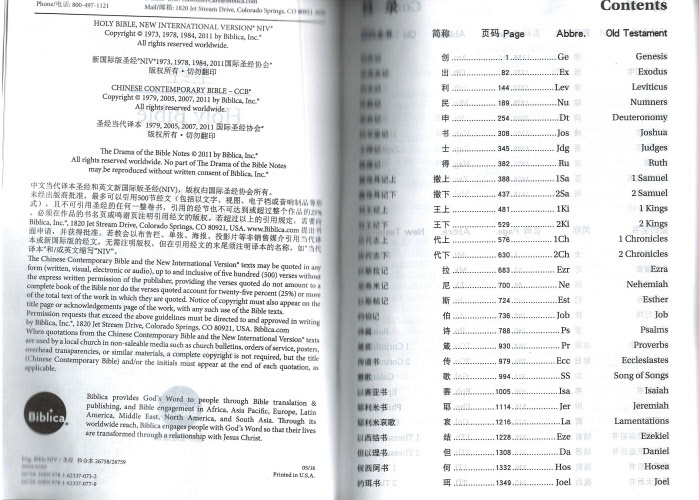 The CCB's natural fluency and precise structure brings a fresh experience to its many readers. 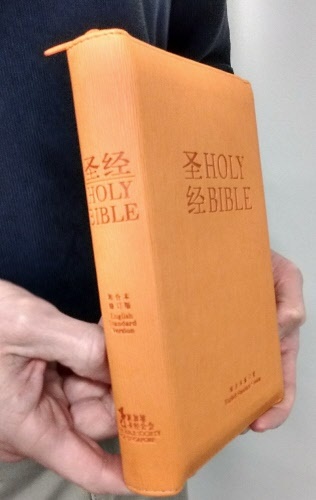 A full case has 8 copies. 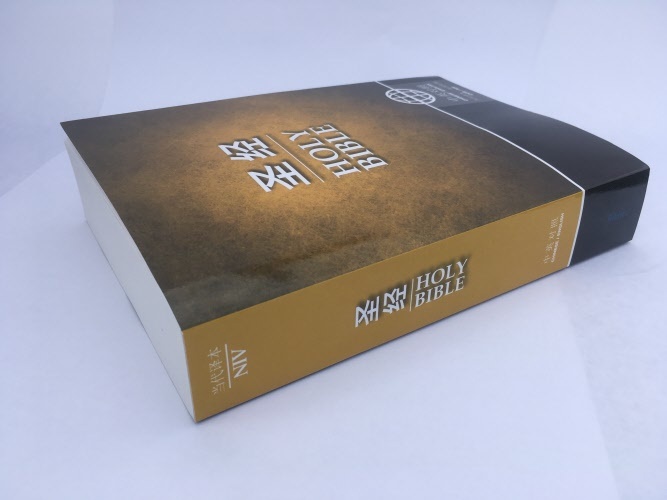 Because the Table of Contents has wrong page numbering for the New Testament books, we will include corrected table of contents pages for each Bible. 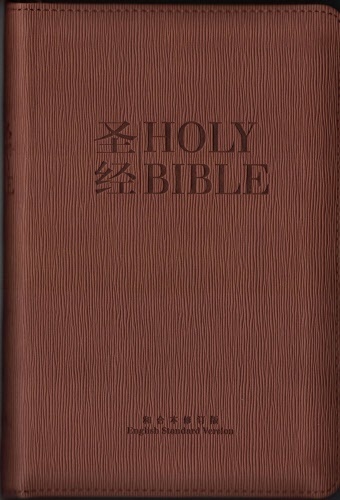 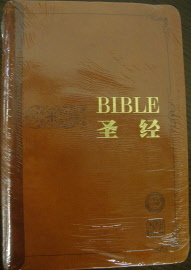 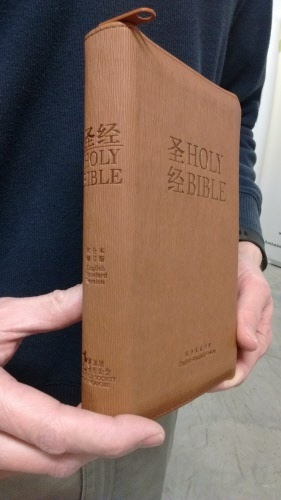 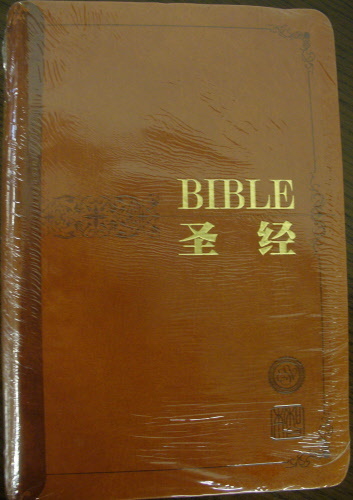 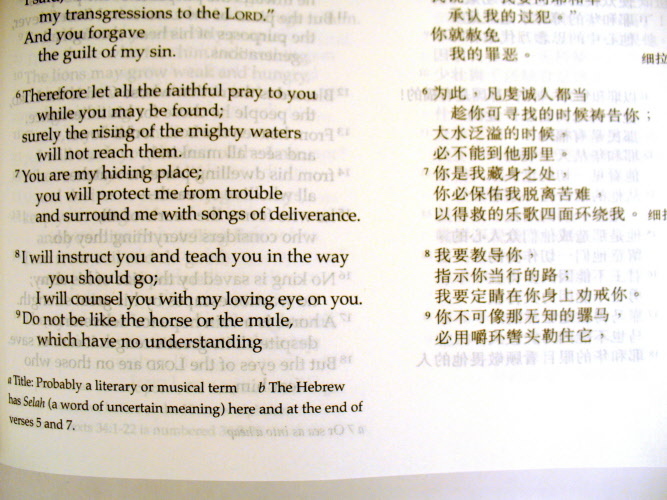 Simplified Chinese Script/English, Chinese Contemporary Bible/New International Version(2011), Hardback, 8.5 pt. 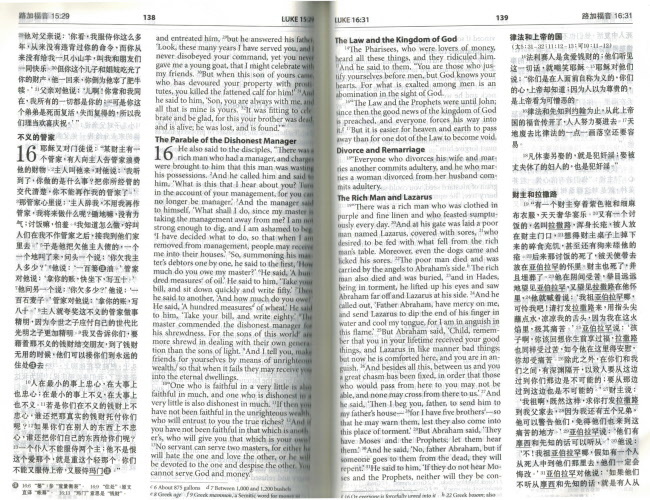 font in Chinese, 9 pt. 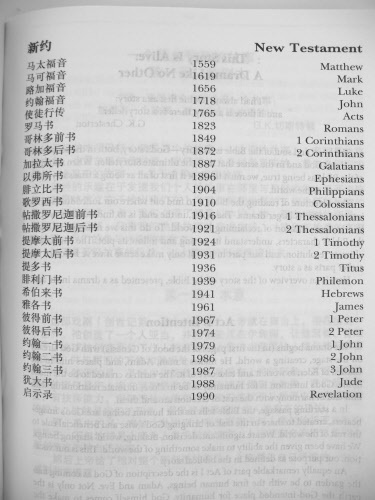 font in English, Maps of Old and New Testaments, a Table of weights and Measures, Footnotes throughout the Bible. 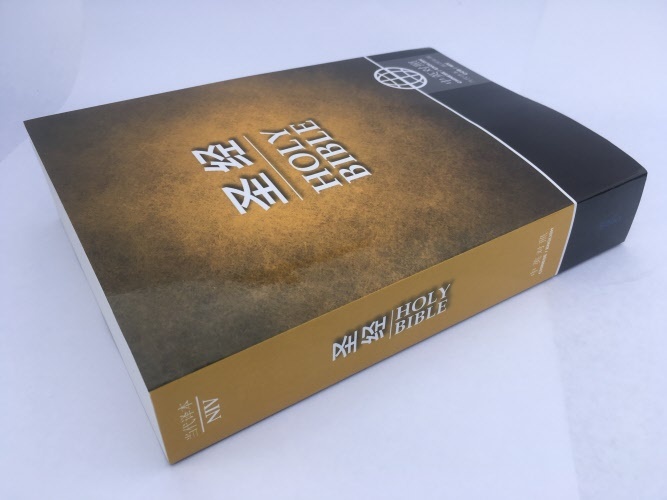 From the Publisher: This parallel Bible offers a side-by side treatment of the Chinese Contemporary Bible (CCB) and the English New International Version. 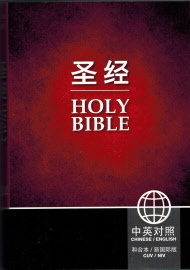 The NIV is the world's most widely read and trusted contemporary English translation of the Bible. 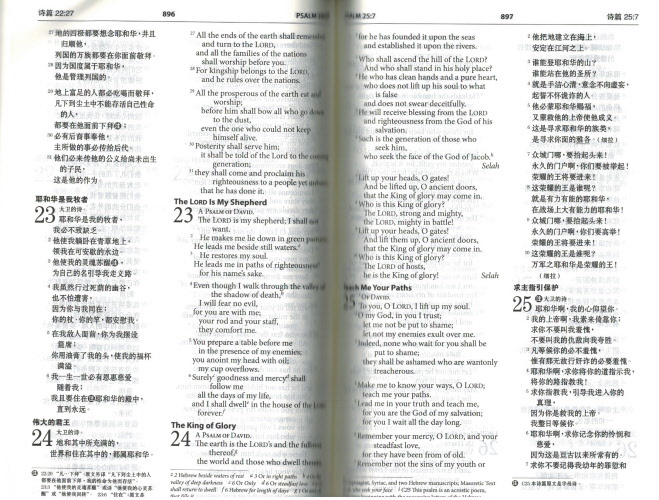 The CCB and NIV are both clear, accurate, easy to understand and uncompromisingly faithful to the original Bible texts. 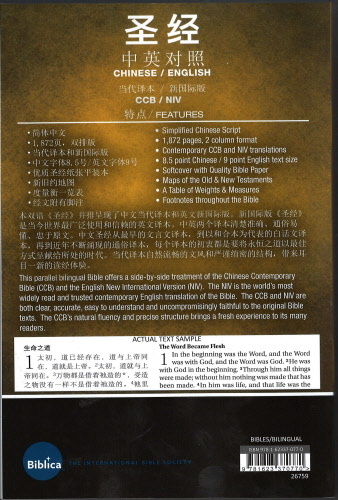 The CCB's natural fluency and precise structure brings a fresh experience to its many readers. 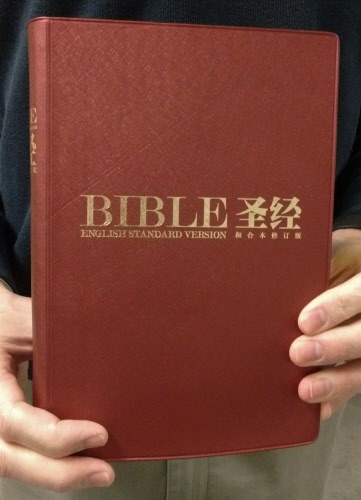 Because the Table of Contents for the New Testament has wrong page numbering, this book is being reduced until the next printing when this will be corrected. 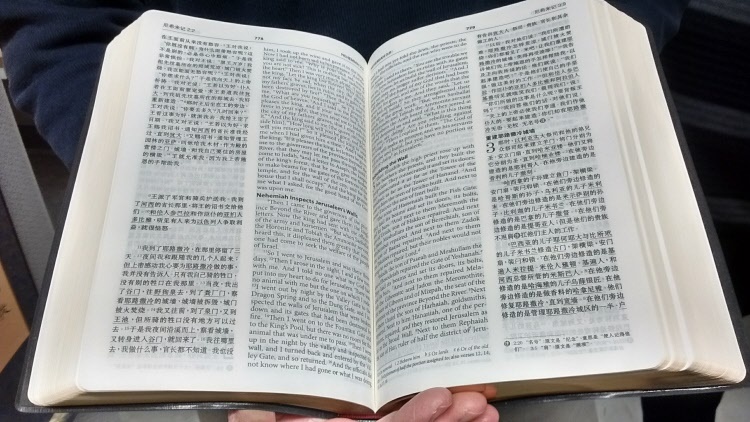 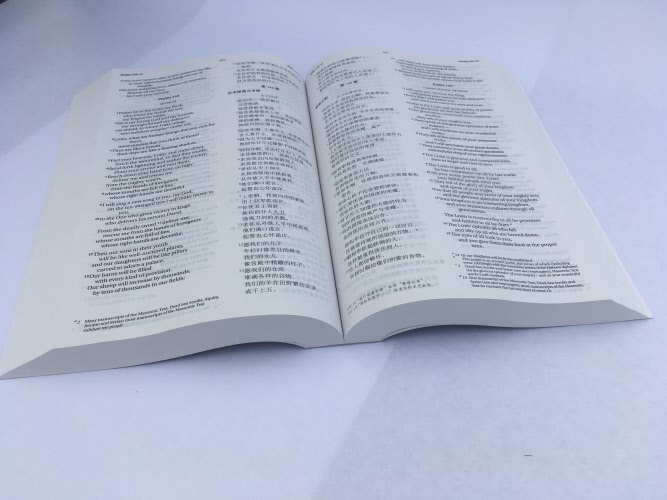 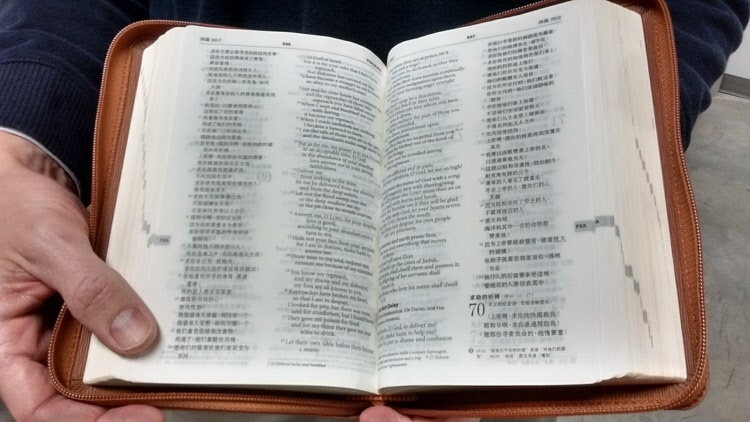 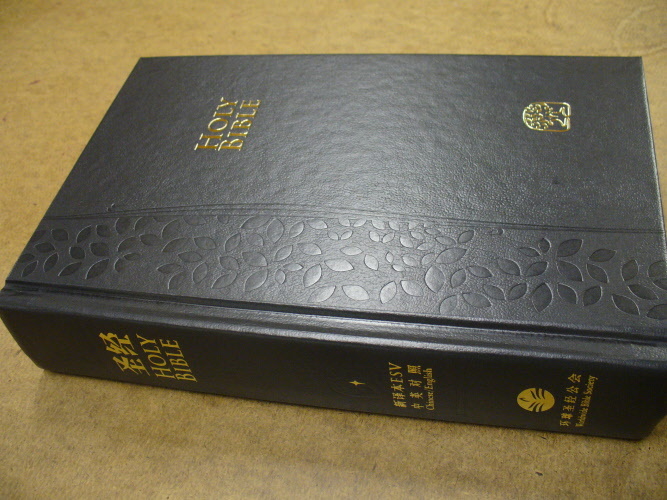 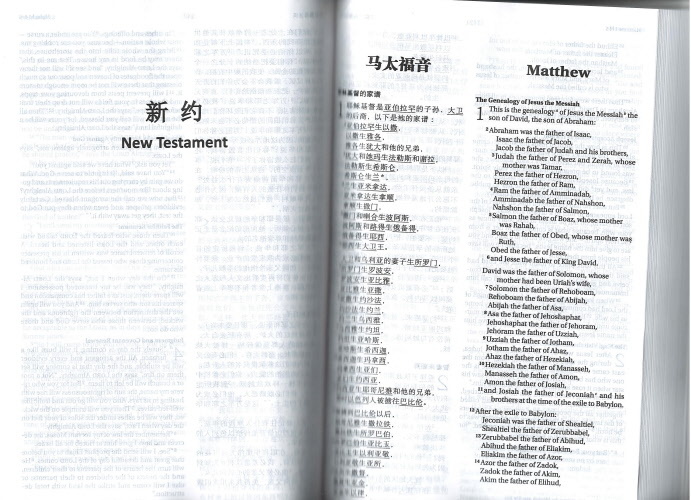 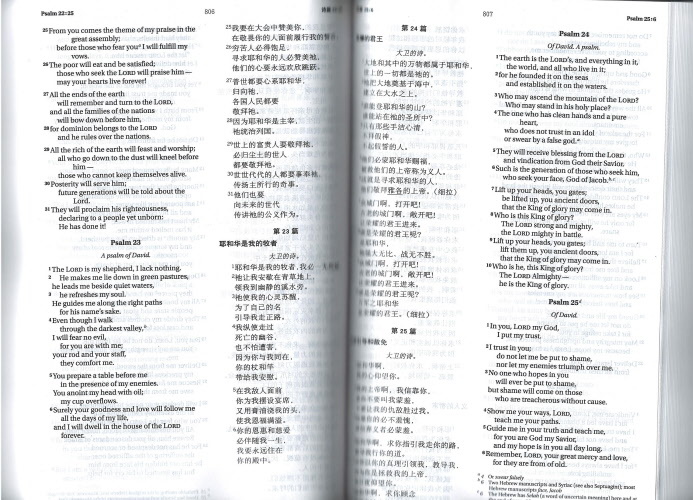 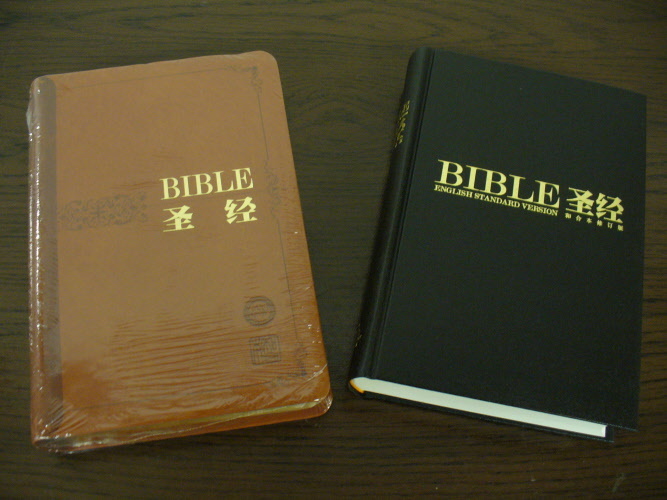 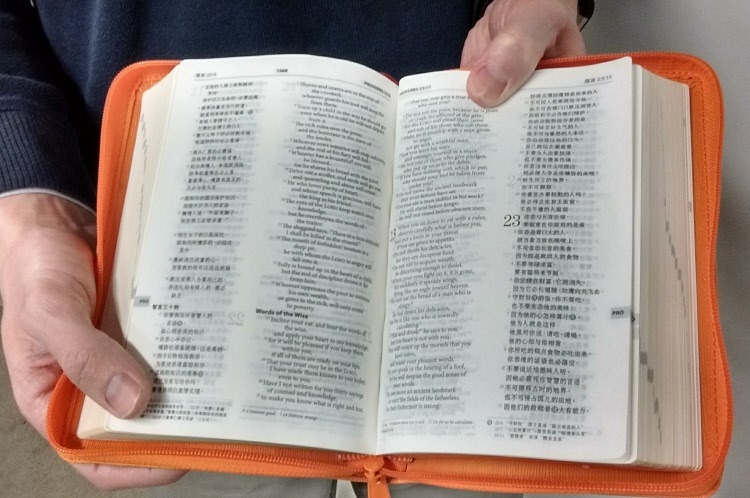 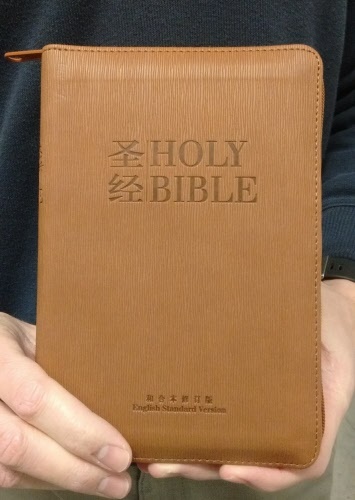 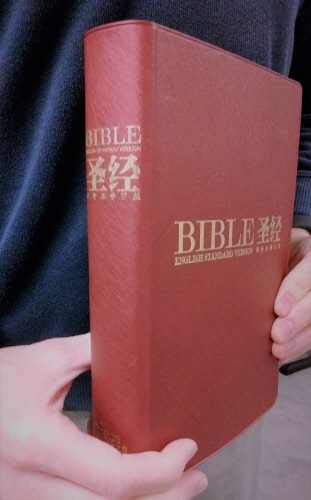 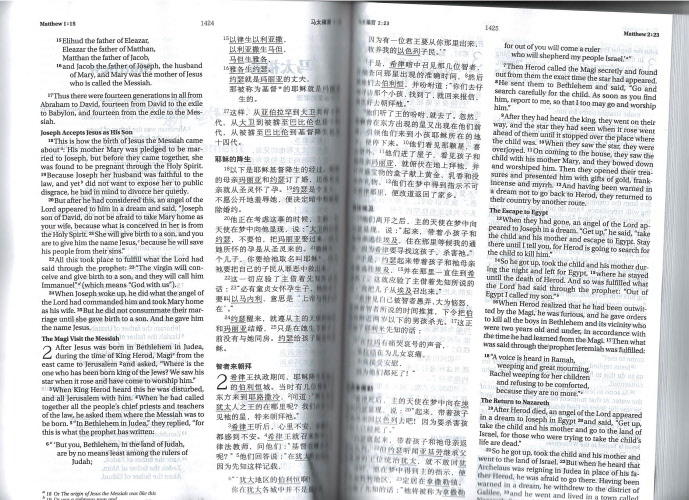 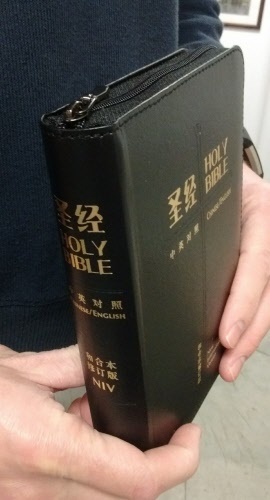 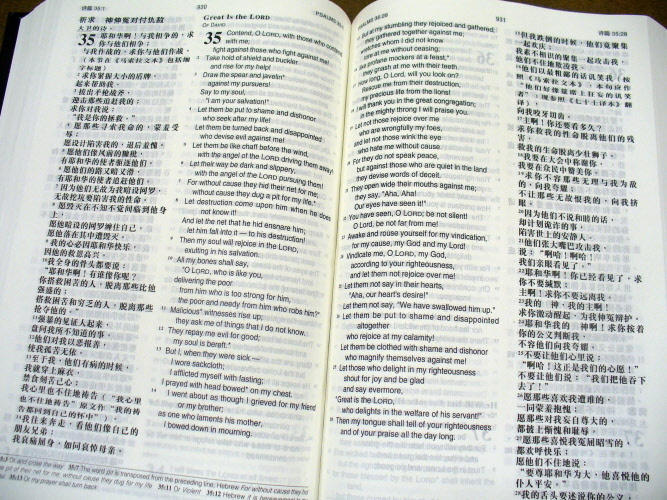 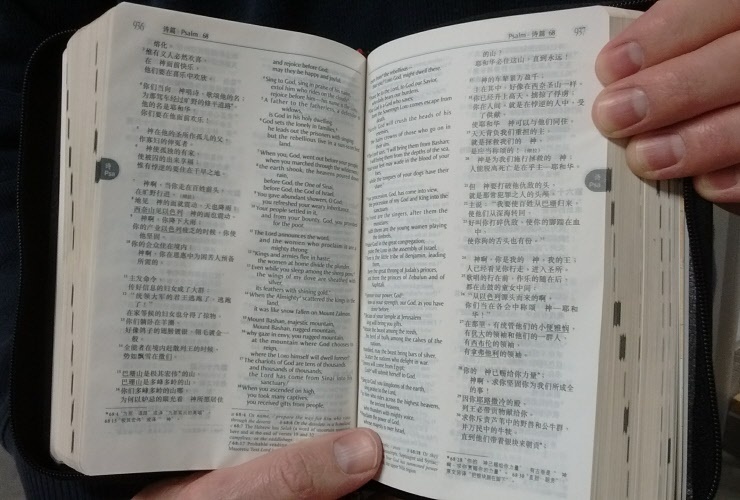 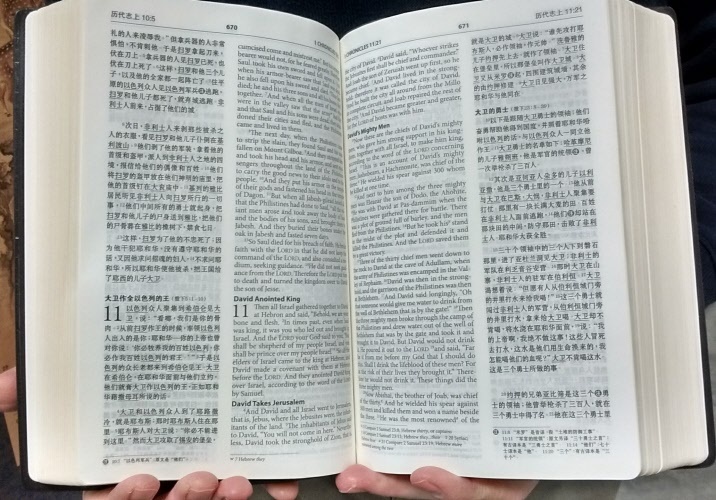 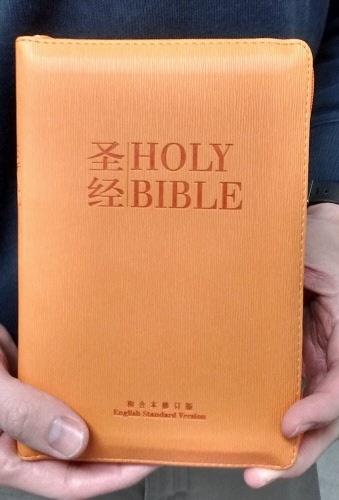 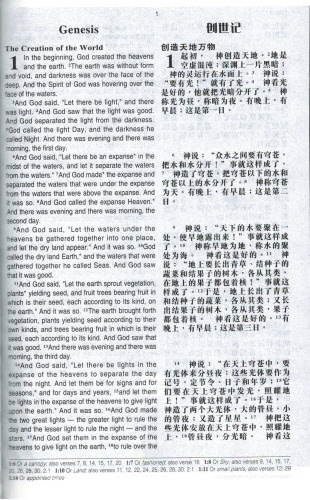 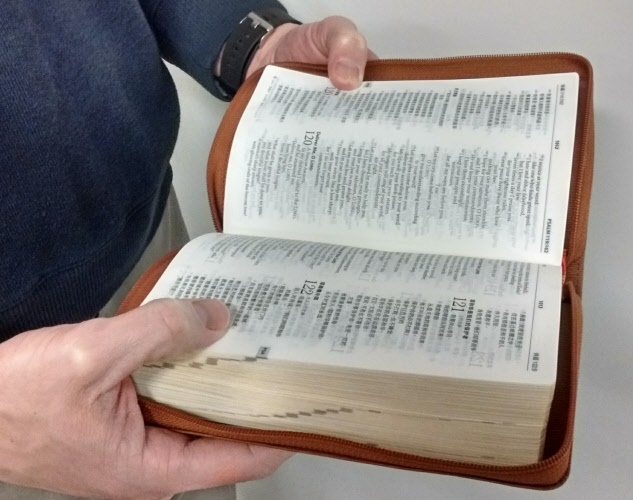 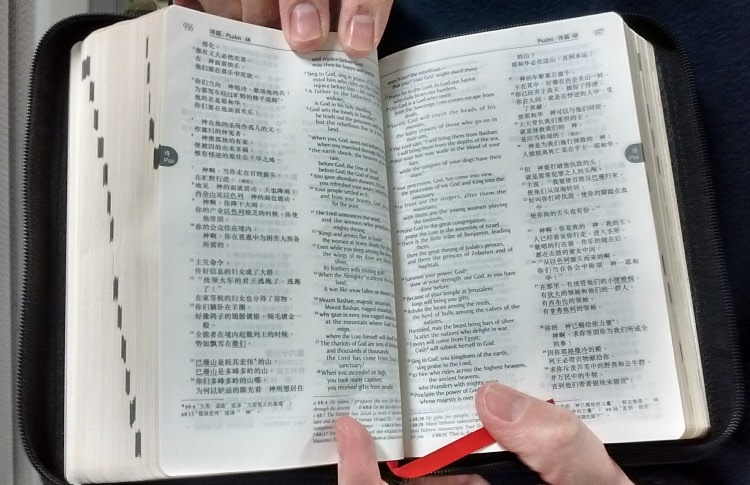 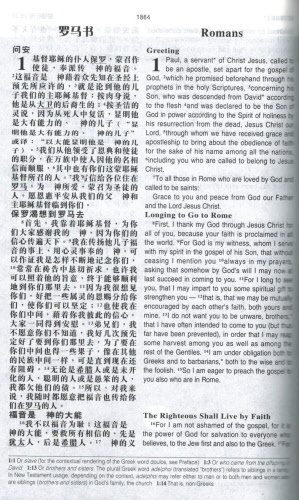 This bilingual, compact, Bible uses the Revised Chinese Union Version, and the New International Version side-by-side. 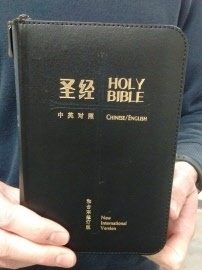 It is 4.75" x 7.5" x 1.5". 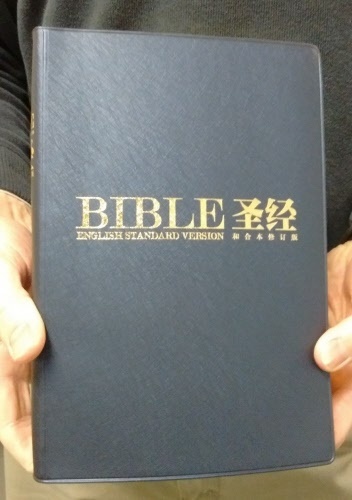 Includes maps in the back. 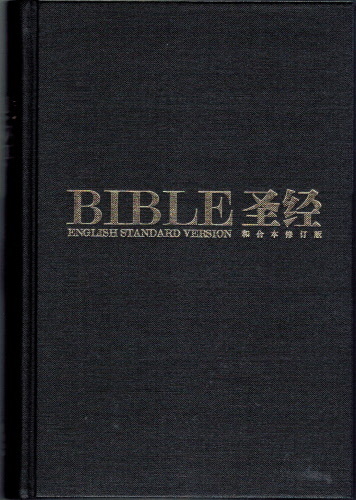 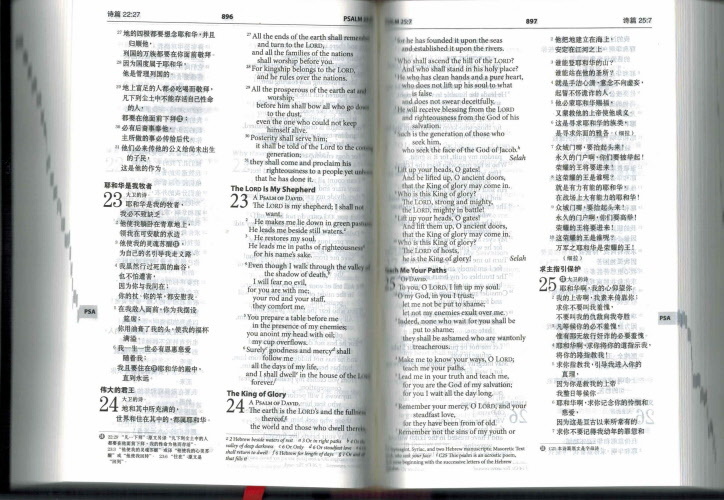 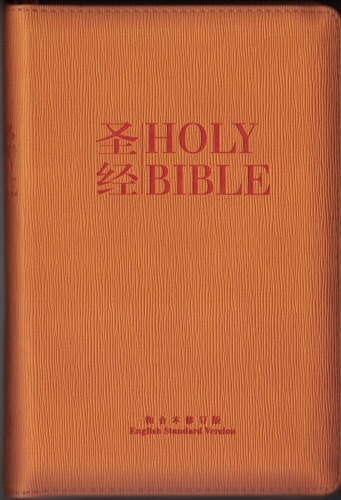 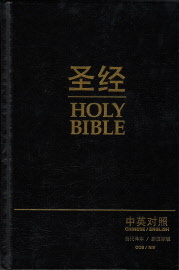 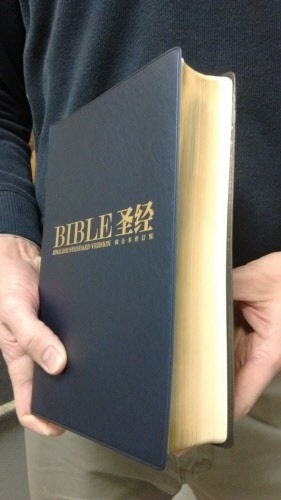 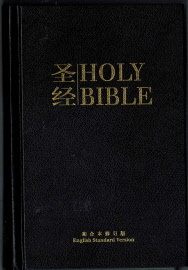 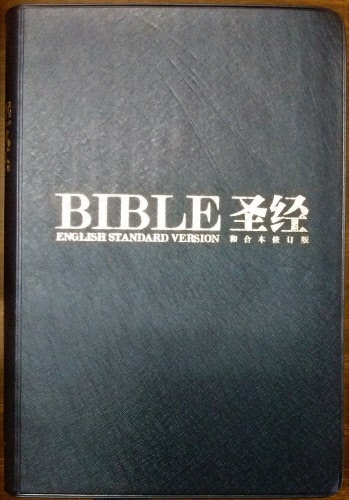 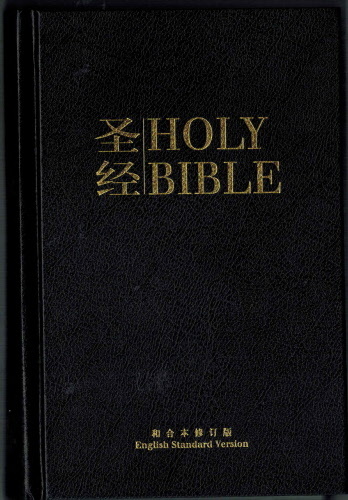 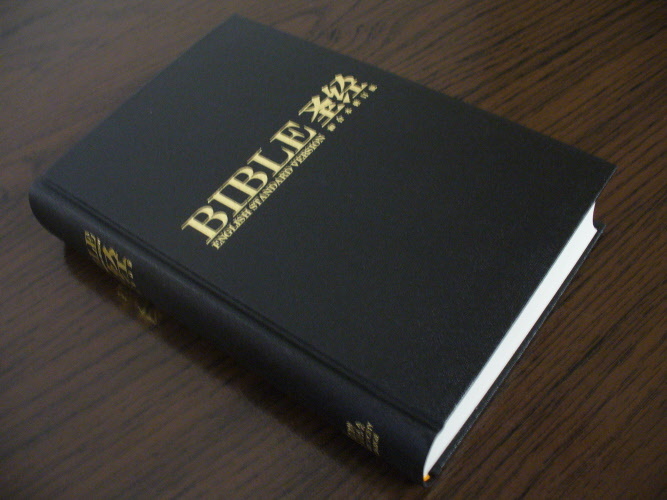 Revised Chinese Union Version/English Standard Version Compact Bible. 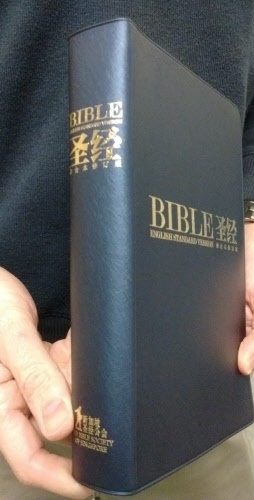 Includes imprinted books of the Bible on the side, and maps in the back. 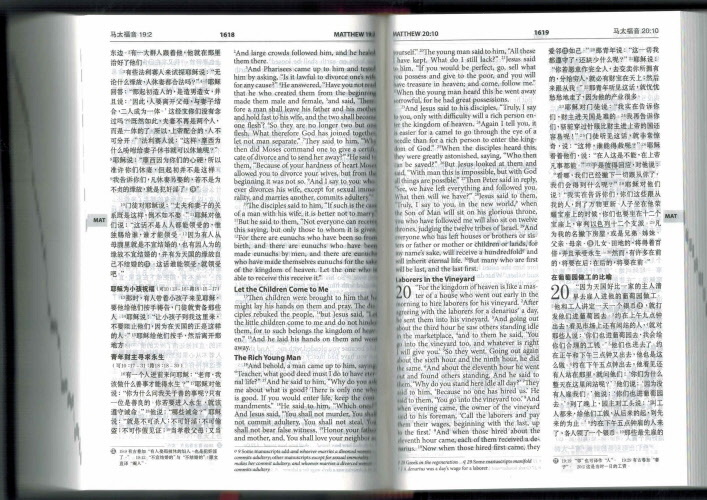 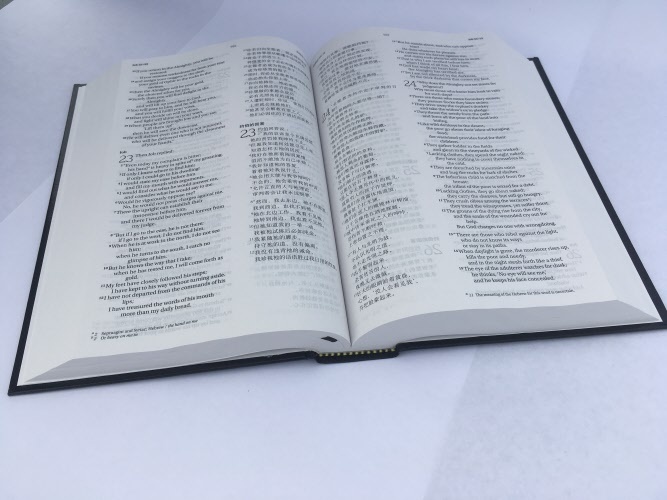 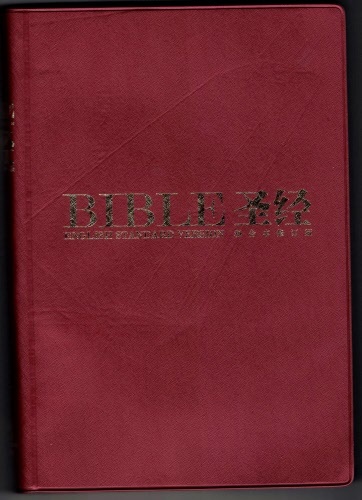 Size 7.5" x 5"
This bilingual, compact, Bible uses the Revised Chinese Union Version, and the English Standard Version side-by-side. 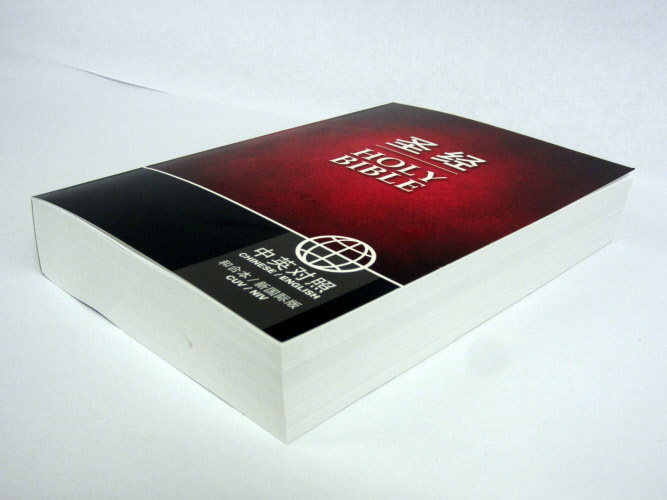 It is 4.75" x 7.5" x 1.5". 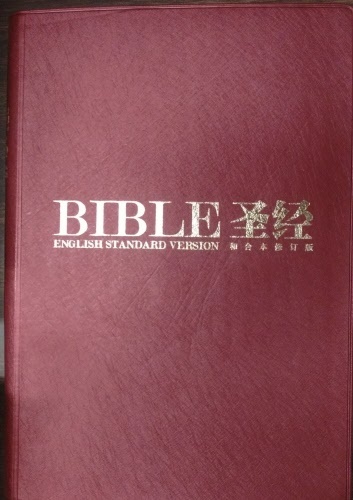 Includes maps in the back. 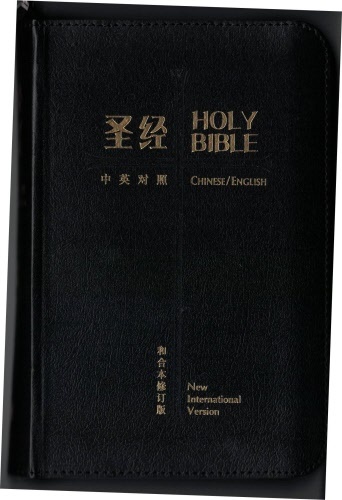 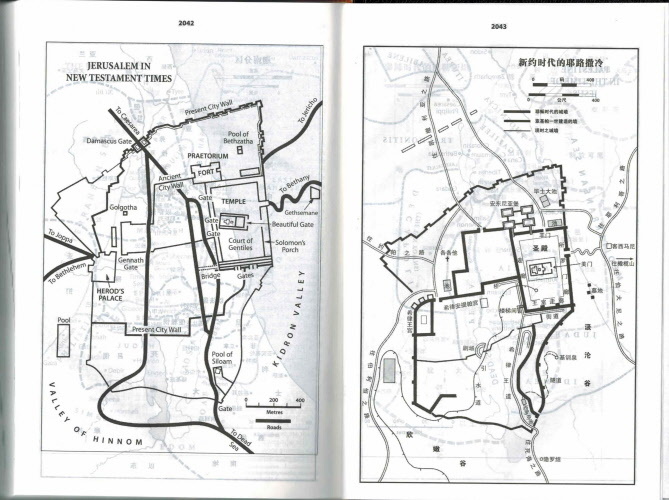 Revised Chinese Union Version/English Standard Version - Standard size - Hardback Black Includes drawings of maps of the Old and New Testaments 6.25" x 9.25" x 1.75"
Revised Chinese Union Version/English Standard Version - Standard size - Leather Cover Brown Includes drawings of maps of the Old and New Testaments 6.25" x 9.25" x 1.75"